What is Chalked & Amazed? Chalked & Amazed is the only "chalk radio" show on the internet. This interview program features some of the most well-known professionals in our field as well as those serious enthusiasts who present chalk art on a regular basis. Have you ever wondered how other chalkers first discovered this unique style of ministry? Or how their career in this field developed and expanded? Perhaps you would like to hear about their most embarrassing moment on stage from yesteryear or what new projects they are developing today. Tune in for all this and more. I did not want this Christmas day to pass without posting a few gifts for you to enjoy. As you know, Chalked & Amazed has a companion site called Golden Chalk Classics. This FREE archive collection is an ongoing project documenting the rich history and literature of chalk talk. Every PDF file has been indexed with OCR software which means you can throw dozens of book files in a folder and search the ENTIRE contents of the folder at the same time using Abode Reader. So, if you want to find ideas for a special theme like Christmas, or a Bible character like Noah, it will be a snap. 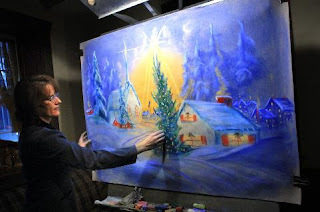 The Christmas artwork above (by E. J. Pace) can be found in one of the following books which I just posted for free downoad, Drawing Men to Christ by Phil Saint. Phil's daughter, Martha Saint-Berberian has graciously granted permission to make this vintage book available for a new generation of chalk artists. Enjoy these classic titles and may your New Year be filled with peace, joy...and chalk dust. 1. DRAWING MEN TO CHRIST by Phil Saint, 1943, 64pp. 3. PICTURED TRUTH by Rev. Robert Fletcher Young Pierce, 1895, 208pp. Dr. Robert L. Smith has a very hefty chalk art pedigree. He has been chalking for over 55 years and just celebrated his 25th year of teaching Communicative Chalk-Talk at Howard Payne University. Dr. Smith has authored two books on the subject and also produced a TV show from 1955-1965 called The Art of Living which featured chalk talks. In addition to teaching, Dr. Smith has worked as a commercial artist and served in pastoral ministries, missions and the US Air Force. Right-click HERE to download the mp3 (audio) file. In 2009 Howard Payne University honored Dr. Smith for his 25 years of teaching. Read the article HERE. Check out Dr. Smith's two chalk art books and order them HERE . Two pictures from his book Ideas For Successful Chalk Talking are shown below. "Dr. Robert L. Smith, distinguished professor of preaching and church administration, gives one of his "chalk-talks" to students during chapel." - Announcing Golden Chalk Classics! Chalked and Amazed now has a companion site called Golden Chalk Classics. This FREE archive collection is an ongoing project documenting the rich history and literature of chalk talk. The name "Golden Chalk Classics" reflects the fact that many of the books were first published well over 50 years ago - some closer to a century. Many of these books are in the public domain and, currently, there are ten titles posted for FREE download - dozens more will be added as they are scanned. Whenever a new title is posted for download, an alert will be made here on Chalked and Amazed. 1. 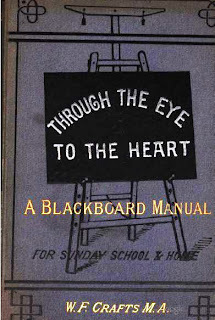 THE BLACKBOARD IN SUNDAY SCHOOL by Henry Turner Bailey, 1899, 131pp. 2. CHALK TALK and CRAYON PRESENTATION by Charles Bartholomew, 1922, 159pp. 3. 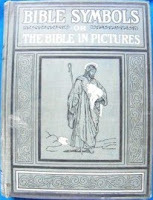 BIBLE SYMBOLS (aka THE BIBLE IN PICTURES) by Frank Beard, 1904, 182pp. 4. BENGOUGH'S CHALK-TALKS by J. W. Bengough, 1922, 162pp. 5. CHALK TALK MADE EASY by William Allen Bixler, 1932, 129pp. 6. BJORKLAND'S PEPPY PICTURE STUNTS FOR THE CHALK TALKER by Harry C. Bjorklund, 19? ?, 28pp. 7. HAPPY HOURS FOR BOYS AND GIRLS by Daniel Elwood Lewis, 1909, 128pp. 10. 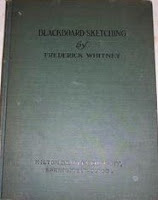 BLACKBOARD SKETCHING by Frederick Whitney, 1906, 63pp. Also note, chalk art books which are still in print and available for sale are listed in the section called Current Chalk Classics (along with vendor links). Links to Golden Chalk Classics are at the top of this page or enter HERE. 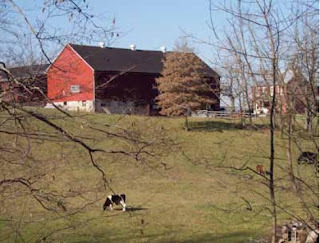 Elva Hurst was raised among the "plain" people of Lancaster County, Pennsylvania - the Old Order Mennonite and Amish. These roots have given Elva a unique perspective on just how effective chalk art can be at opening doors into this ultra-conservative world. Raised with a solid work ethic, this mother of four also finds the time to write books, create art, teach classes, tend a farm and still keep a very busy performance schedule. 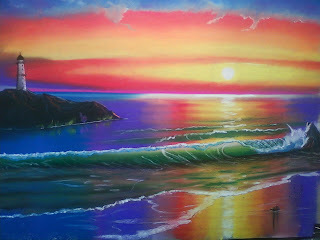 Visit Elva's Chalk Art HERE. You can read a nice review about Elva HERE from October, 2008. Over the years, I have had to wrestle with venues that were not darkened properly. There have been churches with huge skylights, floor to ceiling stained glass, and hosts that “forgot” to cover the windows, causing my fluorescent and hidden drawing effects to glow anemically (if at all). Most recently I was in a new facility which had auditorium lights that could not be shut off completely, only dimmed—a current trend in safety lighting for public buildings. For years, ambient light issues like these have plagued chalkers everywhere. But recently I discovered a fairly simple solution that solves most of these problems for a modest cost. Read the full article HERE. Meet the new "kid" on the chalk art block, Dr. Rick Honea. Although Dr. H has only been chalking for a few months, he is certainly no stranger to the stage. 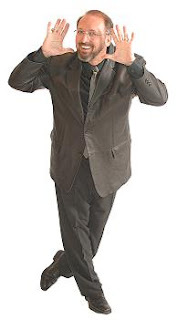 He has been ministering, educating and entertaining as an illusionist, hypnotist, motivational speaker and more for over 20 years. Rick throws himself into everything he does with a characteristic passion that is both rare and contagious. As he is fond of saying, "You've only got one shot at this thing called life." - Visit Rick's chalk site The Fires Within HERE. - Visit Rick's Magic site HERE. - Visit the church where Rick pastors HERE. - Visit Rick's Hypnosis site HERE. - Visit Rick's hypnosis clinic in Lubbock HERE. - Visit the Fellowship of Christian Hypnotists HERE. - Read how Rick uses an iPod in his shows HERE. There was a man in the Bible who was a carpenter for a while before he launched into full-time ministry. That would put our guest in pretty good company. Although he is a carpenter by trade, Mr. James Snyder anticipates the day when chalk ministry will become his primary occupation. His passion is already there. Visit Snyder Chalk Talk Ministries HERE. For those people just getting started, or hoping to, chalk art is among the rarest sub-genres in the world of performing arts evangelism. But there is a place of great joy and power waiting for you between the audience and the easel if you are just brave enough to try! This newly updated book covers the basics: materials, equipment, soundtracks and promotion. 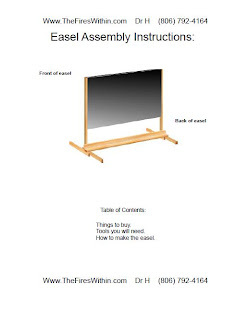 Click on the image to order this 39 page resource. Who is the owner and proprietor of the world's only Chalk Art Resource Center? 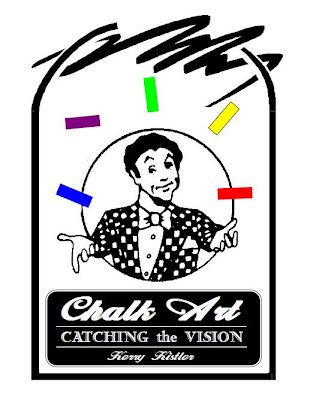 This episode features Dr. David LeGrand, veteran chalk artist, writer, inventor, professor, publisher of Chalk Art News and Chalk Art for Christian Ministry, and the owner of ChalkMart.com. 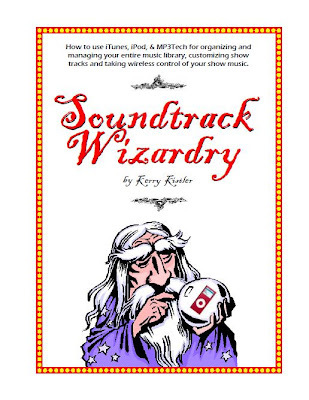 These notes explain how to use iTunes, iPod, & MP3Tech for organizing and managing your entire music library, customizing show tracks and taking wireless control of your show music. This newly updated edition is an entry-level tutorial that will explain the basics for setting up a searchable song database, music selection, mixing tracks, wireless playback and more. Click on the image to download this free 8 page resource. 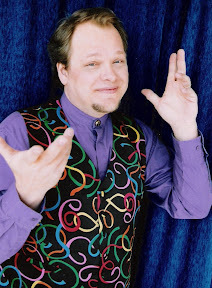 Mr. Dan Ondra knows what it takes to troupe a large, traveling, gospel variety show (and has the bad back to prove it). But even though the semi-load of equipment & props have been retired, one thing has remained the same - Dan's eagerness to assist chalkers everywhere and help their ministries flourish. As he often says: "There's no competition here - we're all on the same team." Dan is one of the most selfless chalk artists I know and has been a personal blessing to me. 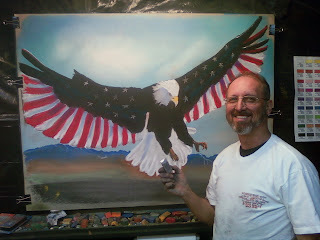 Dan is not just a veteran chalk artist. His resume also includes being a teacher, author, magician, designer, inventor...well, too much to list here. Did I also mention that he is generous? Listen to a streaming version here. 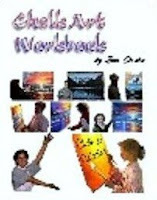 These books are currently available as e-books from Dan's web site. 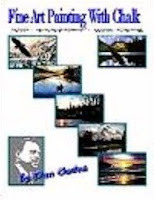 Click on the book covers or titles to order. Chalk Art Workbook A web-based chalk art training program. Learn to draw 7 different pictures step-by-step. 43 pages. 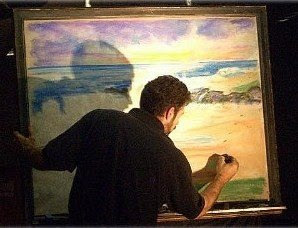 Fine Art Painting with Chalk (aka Art Theory & Therapy) A course consisting of 8 modules. 100 pages. - Read this July 2009 edition of Chalk Art News featuring Dan Ondra. Over a century ago, Sam Loyd designed one of the most popular and magical puzzles ever created—more than ten million copies were produced! This genuine puzzle masterpiece is called “Get Off the Earth” and features a posse of sword-wielding Chinese warriors. I was inspired to re-imagine Sam’s puzzle with an added gospel flavor and had been tinkering around with this for over a year. Then, one day, my daughter Christy suggested using clowns. Viola! 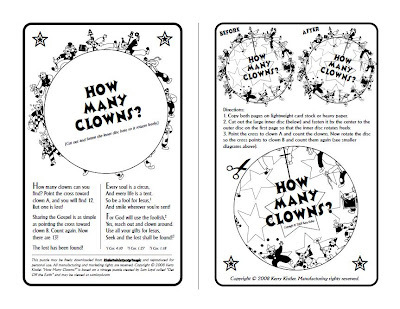 Finally, my version called “How Many Clowns?” is ready for release. Click here to watch the puzzle animate. How many clowns can you find? Point the cross toward clown A and you will find 12. But one is lost! Sharing the Gospel is as simple as pointing the cross toward clown B. Count again. Now there are 13! The lost has been found! And every life is a tent. And smile wherever you're sent! For God will use the foolish. Yes, reach out and clown around. Seek and the lost shall be found! 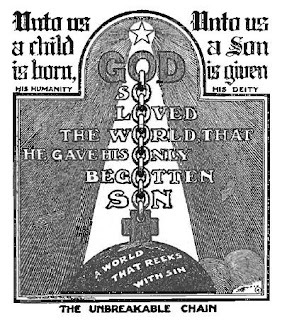 Feel free to distribute this puzzle as a gospel tract or use it as a give-away at your programs. Download a full page (8 1/2" x 11") version HERE. Download a half page (5 1/2" x 8 1/2") version HERE. Have you ever had an epiphany moment in life? Our guest for this episode, Mr. Gary Means once provided such a moment for me in 1996 when I attended one of his chalk art conferences. What I experienced there changed my life forever so it seems only fitting that Gary should be my first guest on Chalked & Amazed! With over 50 years of chalking experience he is well qualified as a teacher of chalk art - and a great presenter (and friend) as well. To see pictures of Gary's 4 books with ordering information, click HERE. 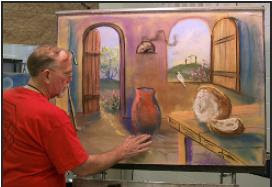 If you would like to watch a time-lapse video of Gary drawing, here he is at Southington Christian Church in rural Ohio where he was a part of their 2008 VBS. Most chalk artists are always trying to improve their soundtracks. Yet, most of us don't want to spend a lot on music. Good news! The amount of free, legal music available on the internet for download is astounding. The problem is that some of it comes with nasty strings attached: pirated files (meaning free to you but often stolen from the copyright holder), embedded Trojan viruses or spyware, and much more. Getting through this minefield can paralyze even the most stouthearted into inaction. 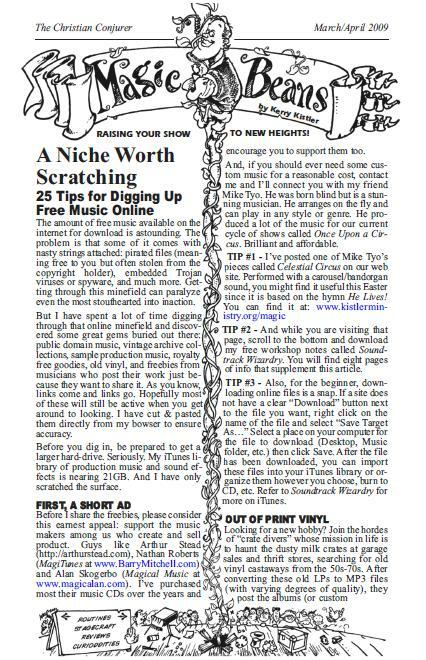 But I have spent a lot of time digging through that online minefield and discovered some great gems buried out there: public domain music, vintage archive collections, sample production music, royalty free goodies, old vinyl, and freebies from musicians who post their works just because they want to share it. As you know, links come and links go. Hopefully most of these will still be active when you get around to looking. I have cut & pasted them directly from my browser to ensure accuracy. 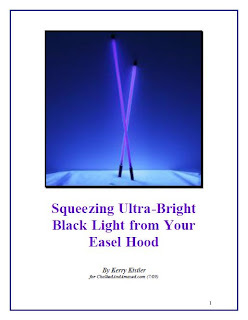 This article was originally written for The Christian Conjurer magazine. If you have a favorite free music link you would like to share, send it my way and I will include it below as a supplement to this post. This first episode of Chalked & Amazed! does not follow the typical news & interview format which future episodes will have. This is actually an original chalk art soundtrack with a Christmas theme. There are two versions of this audio story available for download. This is version one - narrated by me, which is why you may freely download it below. 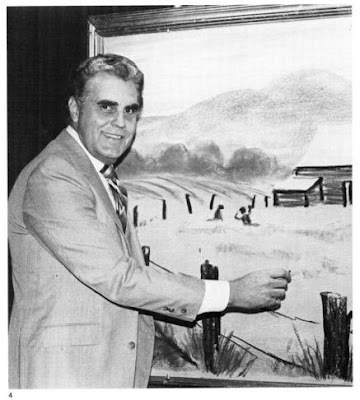 Version two is professionally narrated by George Sarris and may be downloaded as a bonus feature when you purchase Chalk Illustrated, issue #7. A dream inspired this Christmas story over a decade ago which I wrote down and gave to my wife, Jil, as a gift. The idea of turning this tale into an old-style radio drama has been calling to me ever since. Now, I offer this story in its new audio format as my early Christmas gift to you - feel free to use it during the upcoming Christmas season (download a higher quality 256/38mb, mp3 file HERE or a Word version HERE). The rewriting, editing, recording, and mixing were daunting but also a rewarding joy. I have not yet developed a drawing to go with this soundtrack but would enjoy seeing any designs you might create. Introducing something brand new for gospel chalk artists - a podcast designed just for you. It's time to kick the tires and see what's under the hood. It should be a fun ride once we get 'er up to speed so buckle in! The old RV? It belonged to the first chalk artist I ever saw - my boyhood pastor and teacher Rev. Stephen Kiplinger. Stephen, thanks for leaving me chalked and amazed! Life is like a circus - "in-tents." Is Jesus the Ringmaster of your life? This archive project will eventually offer over 125 chalk-talk books for FREE download - 16 titles are available now. Enter HERE. Listen to a brief audio tutorial. See the post from June 23, 2009 for more info on this article.